Murrill Construction Ltd is a family owned, civil engineering company, carrying out highway repairs and maintenance work for local authorities in London and the home counties. We have been a FORS member since 2013 & a Gold member since 2015. I, Mike Lally, have been the Transport Manager since May 2016 and this is my 3rd year of working with FORS. We had completed our FORS Bronze accreditation audit in April this year, this has proven to show a significant improvement in our transport operations, it is obvious that there is a direct correlation between our improvements and the implementation of the FORS scheme. Working with FORS has highlighted the modern working practices of a transport office. We operate 25 vehicles ranging from 3.5t transit pickup trucks to 32t tipper grab trucks, this is a reduction in the number of vehicles on last year. The latest additions to our fleet are 2 new euro 6 Daf cf 32 tone tipper grab vehicles, these vehicles are cleaner and quieter, although our work load has increased over the past year our miles travelled has remained similar to last year, this is due to using the larger capacity vehicles making less journeys. Our plans for modernizing our fleet are well underway, in addition to the two new Daf tipper/grab trucks we have already on our fleet, we placed orders for two new Mercedes Econic 32t tipper/ grab trucks, the Mercedes Econic is one of the latest vehicle models to be as vulnerable road user friendly as possible, we are expecting delivery of these vehicle by March 2019. We have placed orders for five new Isuzu 7.5t euro 6 tipper trucks, these will be to replace the five-old euro 3 converted to euro 4 vehicles we had already disposed of, this will return our vehicle fleet back up to 29 vehicles, we are expecting delivery of these five vehicles by September 2018. We had plans for some electric vehicles on our site at Greenford but due to an unforeseen technical issue with the electrical supply we are not able to install the charging points we wanted. However, we are hoping to have this issue resolved in the near further. Our PCN’s have reduced this year, we had 19 PCN’s issued against us, we had successfully challenged 13 of them, only 6 were upheld. Our km/lt (MPG) figures have increased this year, this is due to us using more larger vehicles with PTO’s fitted, the PTO vehicles is used to drive the crane and need to have the engine running when the crane/grab is being used, these vehicles will have their engines running when stationary rather than driving on the road for up to 50% of the time. As we are primarily a construction company working on behalf of local authorities our vehicles aren’t the main source of noise pollution, however we do operate more larger vehicles with PTO’s to operate cranes and grabs, we try to ensure that the vehicles engines are not running unnecessarily, this is enforced with our Anti-Idling policy. Our levels of reported incidents have increased slightly this year from 12 to 13. We are still carrying out driver assessments at random and when required will send drivers for instruction or training with a driving instructor, this encourages our drivers to report any incident no matter how minor, this in turn has had a positive effect on the willingness of our drivers to report all incidents. Although our level of incidents as only slightly increased this year we at Murrill’s feel that we should be reducing the number of incidents, with this in mind we have been trialling a front and drivers view camera system, this system is activated by sharp vehicle movement of the vehicle and the reports are sent directly to myself, this has proven to be a very useful tool to help me manage our drivers, we have installed this system to 10 of our vehicles so far, the trial is due to end by the September 2018. Following on from our occupational health screening for our workforce last year, we have recruited 2 new drivers this year, and they will be booked in for their occupational health screening by the end of the year. 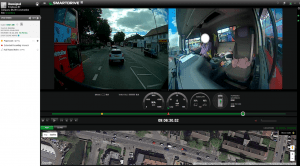 We had implemented a new Telematic system last year which has helped us to track and monitor driver behaviour and vehicle usage, mainly anti-idling.